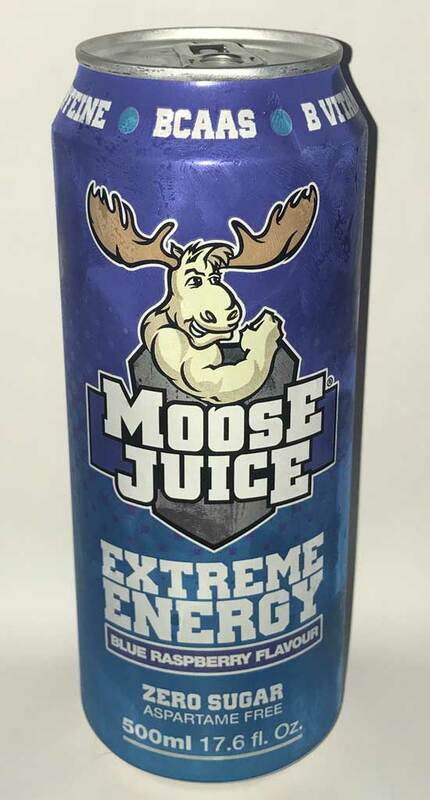 Out of the 4 flavours of Muscle Moose’s Moose Juice currently available at time of writing, this is my favourite. Blue raspberry always reminds me of my walks to/from school as a child because of the range of 1990s confectionary available in that flavour: jellies, soft drinks, ice pops… good memories! This drink is low in calories and designed for the gym goer – it includes BCAAs (Branch Chain Amino Acids) which are a common supplement taken by body builders to supposedly aid the absorbtion of protein into the body post-workout. I only use the term supposedly because I don’t wish to make any claims for or against the supplement, I shall leave you to do your own research on that! I suppose as it’s in there, it does mean that if you have a can of this after your workout, then your post-workout protein shakes wouldn’t need the BCAAs either, but combining energy drinks with protein shakes is a bit unsettling on the stomach in my opinion so I couldn’t recommend it. If we forget the gym setting for a moment, it’s a nice standalone drink, but considerably more expensive than alternatives due to its branding.